261 pages | 10 Color Illus. | 71 B/W Illus. As the car anticipates its dance around the racetrack, the engine growls and pops, and all senses become immersed in the smell of exhaust vapors and the sounds of raw speed and excitement. As it turns out, these also are the sights, sounds, and smells of chemistry! The car is a great example of an everyday device with an abundance of chemistry hiding in plain sight. In fact, almost everything in a car can be described from a chemical perspective. Understanding Chemistry through Cars guides novice chemists and car enthusiasts in learning basic chemical principles in an engaging context. It also supports upper-level chemists in synthesizing knowledge gained over a chemistry curriculum and seeing how it can manifest in the real world. 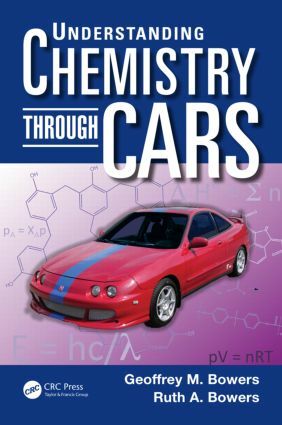 This book provides an overview of chemistry in relation to cars. Various topics are discussed including the ideal gas law, materials chemistry, thermochemistry, solution chemistry, mass transport, polymerization, light/matter interactions, and oxidation and reduction. The book incorporates expected learning outcomes at the beginning of each section, detailed and easy-to-follow example problems, appendices reviewing basic chemical topics, suggestions on how to use the resource in upper-level courses. Ancillary materials, such as a Twitter account and an associated blog, allow readers to explore the latest in the world of car chemistry, ask questions, and interact directly with the authors and other experts. Fuel Cells: Power Plant of the Future? Geoffrey M. Bowers is an associate professor of chemistry and an adjunct associate professor of materials science and engineering at Alfred University, New York, USA. He earned a BS in chemical engineering from Purdue University and a PhD in chemistry from Penn State University. Dr. Bowers’s educational philosophy emphasizes faculty-student co-learning opportunities; uses student-centered techniques and real-world examples in class whenever possible; and stresses authentic assessment, general problem solving, and teamwork skills. He has received several teaching and mentoring awards. Dr. Bowers is also an automotive enthusiast who loves working on cars, driving, and watching many types of racing. Ruth Bowers is an adjunct instructor of chemistry at Alfred University, New York, USA. She developed and implemented curricula exploring the chemistry of consumer products as an honors seminar course and a regularly occurring high school summer camp. She earned a BS in chemistry from Purdue University and an M Ed in curriculum and instruction from Penn State University. Ruth has also been recognized as an outstanding teacher. She spent her childhood mere miles from the site of one of the first successful test drives of a gasoline-powered automobile in the United States.